With linear drumming, you'll only hear one sound at a time. Linear drumming describes the playing (or programming) of a drum pattern in which no two kit elements (drums, hats and cymbals) are struck simultaneously. For the drummer, this means only one limb ever makes contact with the kit at a time, and for the programmer, that only one note is ever active at a time on the MIDI piano roll or drum editor. With the drum kit clearly not designed to be played this way, linear drumming might sound like a purely technical exercise with no creative advantage to be had over regular drumming. However, it can lead to a characteristically funky and spacious sound in a way that 'non-linear' drumming often doesn't. For the producer, linear programming or playing also offers the engineering benefit of thinning a drum part out without detracting from its rhythmic content, thus making it potentially easier to fit into a mix. Achieving a comparable result to the common practice of sidechaining the drum kit off the kick drum in order to make the latter's presence felt, linear drum parts enable every component hit of the groove to be heard cleanly in isolation. In this tutorial, we're going to take a decidedly standard drum pattern and transform it into an energetic and interesting groove using the exact same linear approach that a drummer would if they were playing it for real. 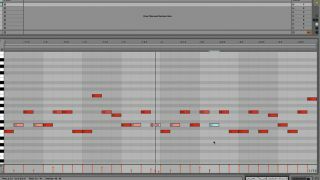 Step 1: Here's our regular, non-linear two-bar groove, which we're using to trigger Toontrack EZdrummer 2. It's nothing particularly fancy, comprising eighth-note hi-hats - alternating between accented and lower-velocity hits - with snares on the backbeat, and a busy kick drum turn and an open hat at the end of the phrase. Step 2: The first bar couldn't be easier to 'linearise' - all we have to do is knock out every on-beat hi-hat! Even with the double kick hit in the middle of the bar, this creates a pattern in which only one kit piece is ever struck at a time. We should bring the velocities of the off-beat hats back up to give the linear groove consistency. Step 3: We have a decision to make in the second bar: should we keep the hi-hat or the kick on beat 2.3.3? You may wish to maintain total regularity in the hi-hat line, but actually, the kick is by far the more important of the two, and linear grooves sound better with a bit of hi-hat syncopation anyway. Step 4: Well, my groove is certainly linear, but it's pretty dull. The key to funking up a linear beat is breaking from regular hi-hats and filling the gaps with hi-hats and snare ghost notes (quieter hits). I place one or the other on every unfilled 16th-note, and move the open hat at the end of the bar slightly to the right. What a difference! Step 5: Moving some of the snare ghost notes, extra hats and one of the kicks to the toms proves transformative, as does a crafty snare press at the end of the first bar and moving the following backbeat snare off the beat. The result is a complex, fully linear, tangibly aerated drum kit part that should be easy to fit into any mix. Step 6: There's nothing stopping you using linear techniques with drum machines, too. Above is our groove, slightly amended, triggering D16 Nepheton. The dilemma we face now is whether to put kicks on beats 2 and 4 - nailing the 4/4 but compromising linearity. What would you do..?